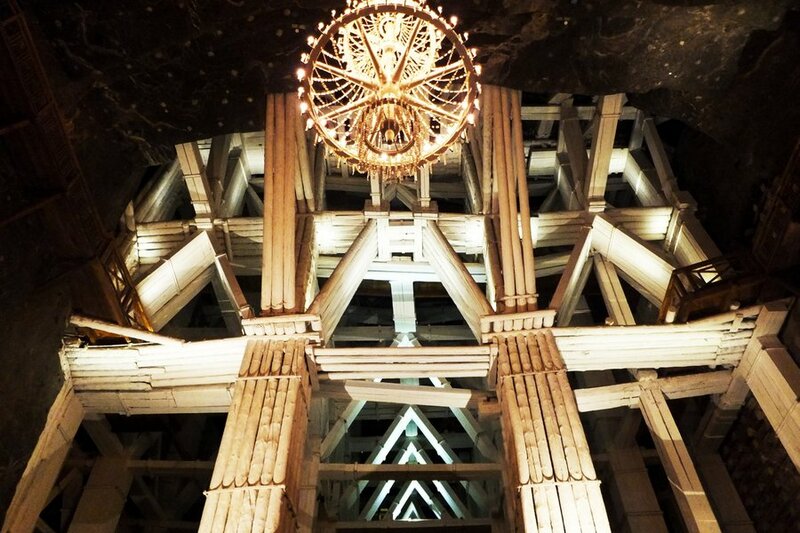 Wieliczka Salt Mine is one of the most valuable monuments in Poland. It was built in 13th century and was producing salt until 2007! In the past Wieliczka was valuable source of salt, today it is visited by over one million tourists each year . In 1978 it became part of UNESCO World Cultural and Natural Heritage List. After visting this place I got interested salt's history - it was one of the main resources my own country built its wealth on. In the past, salt was so difficult to obtain that it was a highly valued trade item and was even considered a form of currency. Common salt (NaCl) is a mineral made of sodium and chloride. Salt deposits started forming in Middle Miocene (about 13.6 milion years ago!). Actually, salt is all around us . It's hidden underground and on the earth’s surface where the ancient seas dried up. Some salt has even arrived from outer space in meteors! But our biggest source of salt is in our seas and oceans - an average of 26 million tonnes per cubic kilometre. Anyway, let's get back to our trip. It was pleasant one-day outing . We went there with Bartosz’s family. There was so many of us that we qualified for Group Ticket. In Wieliczka Salt Mine there are various routes available. We chose the standard and most popular one - Tourist Route. The visits are always done with a guide. The whole sightseeing lasted for about 2 hours. At the very beginning there is about 800 steps down and, in general, quite a lot of walking is included (about 3 kilometres) so it is good to wear trainers and comfortable clothes . I thought it would be colder in there but in fact the temperature in the Mine was about 15 degrees. We were exploring the Mine at 135 metres under the ground. On our way we visited many chambers. There was also an impressive chapel in which weddings and masses take place. There are also beautiful underground saline lakes, big wooden constructions, salt sculptures. In one of the saline chambers there are concerts organized on regular basis! In Wieliczka Salt Mine there are cafes, shops and restaurants so there is no need to go to the surface to get some rest. At the end of our route there was a chance to see Mine’s Museum but everyone (with one small exception – me) was too tired to visit it. Important thing to remember is that animals aren't allowed and smoking's prohibited. I also recommend to check opening hours as they vary according to season (you can check the opening hours here ). What's worth to mention is that Wieliczka Mine is very popular monument in Poland and is visited by crowds of people every day . We didn't buy tickets in advance and had to wait in line for about an hour. Please, be wiser than us and buy your ticket online, which will save you a lot of time. You can do it here . And you, have you ever visited any mine? What was your impression?